This year was my 30th birthday and when asked what I wanted to do to celebrate, my only wish was to spend it in Halfmoon Bay, Seachelt at my family cabin on Redrooffs road (we call the cabin Redrooffs). The cabin is currently unusable due to old age and mold, but it is awaiting a tear down and rebuilt which will hopefully be one day soon. Which means that staying at the cabin was not an option (insert sad face here). Thankfully I have inherited some pretty awesome friends through my partner, Collin, and they did not hesitate to offer the guest house at their parents’ house for us to stay for the week of my birthday. The Rae’s live only a 10 minute drive down the road from my family cottage (and a 30 minute kayak ride), so we were able to visit often. 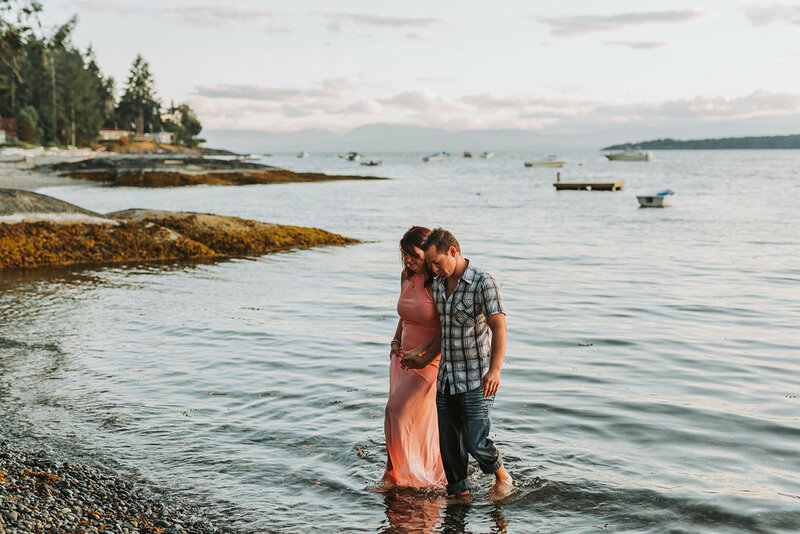 Also on the sunshine coast is a photographer who I have been following for years (Jennifer Picard Wedding Photography) and I knew immediately that booking a session with her was a must. A session with the love of my life at my favorite place in the whole entire world before it gets torn down and rebuilt ... yes, yes, yes please! 1) Picking outfits for a session is HARD! I cannot even count the number of times that I changed and how many different combinations that I layed out on the bed and how many snapshots I sent to my friend and fellow photographer for a second opinion. I spent countless hours on Pinterest and Google looking at blog posts and images. I came home right away and wrote a blog post of my own with clothing suggestions and want all BOP clients to know that I welcome snap shots of yourself in a potential outfit, of outfit combinations layed out together, and of yourself in the store change room before committing to purchase that new dress or top! 2) The camera is less scary than it seems. I was so nervous that I was not going to be natural in front of the camera or be able to show genuine affection, but I was so wrong. The camera just seemed to be non-existent. Jennifer was so friendly and so comfortable to be around that I felt like we were just hanging around with a friend, and I hope that my clients can say the same about me. 3) Waiting for the images made it so much more emotional. We waiting a few weeks for our gallery and I was so anxious to see them. When we did get our gallery I was so blown away at the images because we were removed from the event and it was distant in our memories. They were more than worth the wait. I bawled looking through our gallery. 4) Seeing the love in someone's eyes through a photo is so impacting. I see Collin looking at me all of the time, but I rarely catch a glimps of what Jennifer was able to capture. The look of love in his eyes just completely blew me away. My new goal is to focus on the smaller details and the looks of love. Here is she is, the old cottage. She is tarped up and falling apart but she is gorgeous! This is where the fondest memories of my childhood were created. This is my favorite spot in the whole entire world. I can have the weight of the world on my shoulders and come to sit on this beach and it all seems to wash away with the tide. Sharing this spot with Collin was so special and I am thrilled that he loved the Sunshine coast and would come back in a heart beat. In this image we are standing on the porch where I we would sit every morning and every evening. This is the beach directly in front of the cabin where we swam every day when we were there in the summers. This! I have an image of this dock blown up to a 24x36 in my dining room, that is how much I love it. My brother and I used to take the row boat here after dinners to get ice cream cones at the general store. This here is the general store that is in front of the dock. It has always been somewhere that we have gone after dinner for ice cream cones, and as we got older we also made frequent trips for wine and beer. Over the years I have taken many means to get to this store. I have hiked through the trails, kayaked, rowed our old row boat, swam next to the row boat, and gone over in my grandpas power boat. This is a log in front of the cabin, and as we were sitting her looking out at the ocean, I started to cry. Here we are standing in the sleeping porch. My bedroom as a kid. My brother and I used to sleep in here. I would be in this back corner and he would be on the bed by the door .. sleeping with a tennis racket just in case animals came into the room. My last year visiting the cabin back in 2013, my grandmother and I slept in here. These rocks were always lined with starfish and a small farm of oysters that old man Forester harvested. As kids we used to jump off the end of this rock at high tide. The plan was to jump for a photo but on the day of our session I chickened out. As I said, memories come flooding back when I look at all of these images and it makes it all the more special! So, when choosing a location for your session, think of spots that have meaning to you! And now to end my blabbing and get to the rest of the images that Jennifer so perfectly captured for us!